It's not exclusively Chicagoan, nor is it clearly Romanian, as we'll see. But at one time Romanian (or Roumanian) skirt steak was a famous dish in Chicago, and I was a bit surprised that it was so new to lifelong Chicagoans last night at Manny's, less surprised that it was scarfed happily and admiringly. Even Google doesn't get you a clear answer as to what makes a Romanian skirt steak Romanian. Ken DeNicola, owner with his partners of Frank's Steaks, isn't sure either - even though it has been the signature dish at Frank's in Jericho in Long Island for 20 years... Whatever the origin, this chewy steak, accompanied by onions, is intensely marinated in a secret formula of garlic, soy, duck sauce and Worcestershire sauce, according to the menu. Dutch comedians, you say? They sound Lower East Side Jewish. And so they were, a famous Jewish vaudeville team. Dutch in this context actually comes from "Deutsch," German, and German in this context actually means Jewish, but on the vaudeville circuit in those days of widespread casual anti-semitism, "Jewish comics from New York" was thought to be too sensitive and might drive audiences in the sticks away, so "Dutch comic" was the euphemism. Which everyone knew meant Jewish comics from New York, not jokes about Rembrandt and wooden shoes, but no one ever said prejudice was rational. So where does skirt steak enter this picture? Well, it's an inexpensive cut, a bit of a throwaway today since there's not that much of it per steer and thus it's inefficient for modern meat counters to sell (hence its relegation to restaurants where it gets chopped, like fajitas). But marinate it to tenderize it, then grill it and it's a very tasty piece. And as a long thin cut that covers a lot of plate, it always looks like a good value as steak goes. So a whole genre of "Romanian" restaurants serving it grew up in places like the Lower East Side in New York and the Maxwell Street area here, back when that neighborhood was widely known as Jewtown-- and was conveniently close to the stockyards, making it easy to pick up a scrap cut in quantity. I doubt that LTHers like ourselves will have difficulty projecting themselves back into the mindset of the kind of customer who would have passed by the proper dining rooms at the Loop hotels, to venture instead to a bohemian hole in the wall in Jewtown serving inexpensive steak with, probably, a violinist playing Humoresque, a mural of Old Country scenes painted by an itinerant artist, and a interestingly bohemian crowd. He finishes by noting that Goldstein's was "the favorite eating place of Tine Bimbo, the king of the Gypsies," which is one of those sentences that conjures up an entire world in which the king of the Gypsies is somebody reporters like Ben Hecht and Walter Howey would have run into during a night on the town. (Eat your heart out, Sula.) Even if Drury made all that stuff up ("The apple strudel at Klamminger's is so renowned that Lin Yi-Chao, legendary warlord of Mongolia, had it flown it by dirigible to his troops before his siege of Nanking"), it is a joy to read, and makes our modern era seem so colorless by comparison ("Shaw's was a favorite eating place of Richard Notebaert, former CEO of Ameritech"). This distinction between a Jewish restaurant and a Roumanian one is likewise muddied in the discussion of Cafe Royale, where "Jewish, Russian and Roumanian dishes tempt your palate" amid the bohemian (but not Bohemian) revelry. Most likely, the so-called Romanian restaurateurs were merely savvy sorts who saw a good thing and figured, Polish, Romanian*, who's gonna know? They had Roumanian chefs from Minsk by way of Brooklyn, we have sushi chefs from Seoul-- and Guerrero. You can pretty much guess where Romanian skirt steaks survives-- Manny's, Myron and Phil's, no doubt a few other old school places in suburbs with high Jewish populations. Have one at Manny's and you will be eating, quite literally, in the footsteps of proto-LTHers 70 and 80 years ago who made a similar trek to the vicinity of Halsted and Roosevelt to pay a little less for a steak with a lot of flavor and an extra side of atmosphere. No more fitting course for an LTHForum Christmas party could be imagined than a classic Jewish-- I mean, Roumanian-- skirt steak. I had no idea that it had history in Chicago, I thought it was a New York thing as the only place I have seen it is at Sammy's Roumanian steak house. I had the chance to visit this old school spot in New York a couple years back and didnt exactly walk away impressed but none the less thought the skirt steak at the very least was tasty and would most likely have been back for the smae thing if I lived in NY. Thank you for an interesting read. It will be interesting if our efforts today will even exist to be read and referenced 70-80 years from now. Very interesting. I actually became aquainted with Roumanian Skirt Steak at Wildfire, of all places, where it is a standard option on their menu. Its one of my favorite items when I end up there. It seems like I have seen Skirt Steak for sale widely, including Whole Foods. Like Flank steak, it may be turning into a new "trendy" meat cut, due to it's popularity in Mexican cuisine I would guess. Not sure if it has hit the $12.99/lb price I have seen for Flank Steak at Whole Foods (!! ), but maybe some day. I'm a bit surprised that Romanian Skirt Steak was not completely familiar to one and all. I grew up with it being served at many restaurants I went to with my family growing up, and it remains a staple at places such as Myron & Phil's and every Greek coffee shop that I know of (at least the ones on the North Side). Perhaps it's a Jewish thing, although I have never associated it with Jewish food per se. Is it only the non-Jews who were unfamiliar with the dish? Up until Mike G posted this, I had no idea that it was a new dish to anyone. When grocery store meat counters went from being butcher shops where the meat was actually cut on site from carcasses, to counters where cryovacked, precut meat was merely laid out for display, a lot of common cuts became harder to find because the big grocery chains didn't want to deal with one or two of this and that; they wanted a box of 20 sirloins and a box of 10 chuck roasts and so on. Flank steak in particular is an example of the kind of cut that became fairly hard to find at one time. (I wrote a brochure in the 80s for a Kansas meatpacker that was trying to get things like flank steak back into stores.) I think the pendulum has swung back a bit since then, but still, these things are not always easy to find by any means. I'm a bit surprised that Romanian Skirt Steak was not completely familiar to one and all. To judge by reaction when I excitedly ordered one (having never known Manny's offered it till last night) and gave away most of it, no, it isn't especially well known, even among... Roumanians. Last edited by Mike G on December 17th, 2007, 12:02 am, edited 1 time in total. Manny's only offers it during dinner, as far as I know, and it has only been on the menu since they started opening for dinner. I've had it twice now, and like it a lot. A huge portion, very nicely seasoned and properly cooked. It was staple diner/deli fare in Detroit, when I was growing up, and I think you'd be likely to see it in most northern big cities. I've typically seen it with grilled onions and red bell peppers. I'm not sure I agree that "Romanian" was a code word for "Jewish" so much as it was a kind of Jewish in-joke. As noted here, Romanian Jews were rather low in the pecking order of Jewish immigrants. At Sammy's, the skirt steak is actually listed on the menu as "Roumanian tenderloin." This is a joke, not only because skirt steak is a cheaper cut than tenderloin, but because tenderloin isn't a kosher cut. I suspect that the name and dish spread across the country from there. I would have pointed out the klezmer connection if jbw hadn't beat me to it, but for those of you who didn't follow the link, "Rumenye Rumenye" is a famous Yiddish-theater tune about a fantasyland of the good old days. ("Oh, Rumania, you were once a wonderful land, where it was a pleasure to live, and to delight in the joys of wine, women, and comradery.... A little mamaliga, a little pastrami, a little sausage and a glass of wine, aha!") The composer, comedian Aaron Lebedeff, was from Belarussia, and had never been to Romania. It was a joke about Romanian Jews waxing nostalgic for the Old Country. I seem to recall the Belden deli on Western had Romanian skirt steak, along with the more widespread Grecian skirt steak, and I'm sure I've seen it at similar sorts of places more recently. What's Cookin'? Whistler's? Somewhere like that. I've eaten skirt steak at restaurants of late, but can't recall ever ordering them, or seeing my parents order them, while I was growing up. We did eat a fair amount of skirt steak in the summer months. My mother's "secret" recipe was to marinate them in a well-known brand name italian dressing that rhymes with "Fish Phone" and my dad would grill them to perfection. This is still my favorite preparation for this cut. Skirt steak was a childhood favorite of mine and remains so to this day. That's interesting that "Roumania" may have been the all-purpose lost paradise for immigrants from many different (but not dissimilar) places, and thus how "Roumanian" came to be the commercial term for restaurants evoking Jewish homelands generally. In reverse, it's a little like the way Eastern European places now get named for Hawaii or Florida-- I'm sure on a gray winter day in Sofia or Gdansk, a specifically American tropical paradise hit all the buttons. 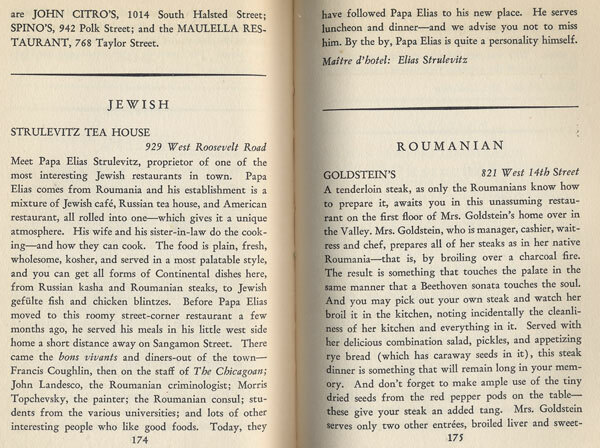 It may have spread from New York-- given the history of Jewish immigration, odds are it did-- but it didn't spread from Sammy's Roumanian as such, because Sammy's wasn't even the first Roumanian restaurant in its space, as this page relates. I also notice that the sign calls it "Sammy's Roumanian-Style Restaurant," also a sign of changing times as it seems to be making a subtle distinction between "Roumanian-style" (ie Jewish) and "Romanian" (as in, an actual Romanian immigrant restaurant). Which is a distinction that older restaurateurs would have been no more likely to make than Irving Berlin would have written "Easter-Style Parade." My Bubbe's Roumanian Skirt Steak was marinated for hours in Kikoman soy sauce. She claimed Kikoman was carried across central asia to Poland via Romania by Rabbi Akiva the same way Marco Polo brought Spaghetti to Italy from China! Btw I love Sammy's Roumanian Steak House...Any place where the finish the chopped liver tableside is alright in my book. Last edited by iblock9 on December 17th, 2007, 2:25 pm, edited 1 time in total. iblock9 wrote: She claimed Kikoman was carried across central asia to Poland via Romania by Rabbi Akiva the same way Marco Polo brought Spaghetti to Italy from China! Kikkoman Foods Inc announced in May 2003 its intention to expand its production plant in Lake Geneva, Wisconsin, USA. The company will invest $100m in the plant until 2013. The first phase of the expansion, which started in early 2004, will require an investment of $13m. The expansion was sited in Wisconsin because of its central location in the US, easy access to high-quality raw materials and the excellent water quality. Growing up, we went to Joe Stein's Romanian Restaurant in the 5400 block of N. Sheridan Rd in Chicago. They were famous for their skirt steak and had strolling "gypsies" playing. My grandparents loved the old world atmosphere. It was there for many years, it was an old house and I remember walking up stairs to get into the place. Alas, more buildings needed to be built on Sheridan Rd. The building is still there. It's been a Chinese restaurant "Wing Hoe" for the last 25+ years. I'm not sure where the Romanian comes from, but I do also remember going to Joe Steins not only for skirt steak but the bottle of red pop on the table. Skirt steak was not called skirt steak when I was growing up and you bought in kosher butchers. It was known as tenderloin. I remember going to Jewel after I married in 1960 asking about tenderloin and as you guess you know what they gave me. I'm not sure when I learned the name skirt steak so that I knew what to get. Tenderloin aka skirt steak was a tender less fatty steak and relatively inexpensive as well as being kosher where there are so few options for steak. The only other tender steak would be rib or rib eye. There was something called a beauty steak which I think is eye of the chuck but I'm not sure. Anyway thats the back story of how skirt steak became known as a Jewish Steak. The price started to go up once faitas became popular as so many other foods such as chicken wings that once were cheap are now expensive thanks to restaurants buying them. Artie wrote: The building is still there. It's been a Chinese restaurant "Wing Hoe" for the last 25+ years. A good spot for egg rolls, BTW. What's Cooking? Restaurant in the Lincoln Village Shopping Center has had Roumanian Skirt Steak on the Menu most times I've visited, from what I'm recalling. I haven't ordered it before, but probably will now - after reading this interesting discussion. My first wife's grandparents came to the U.S. during the first decade of the 20th century. Ma and Pa Schwartz both came from Romania. When I started dating (and eventually marrying - and divorcing) their granddaughter, I used to hear about two Romanian restaurants that had been on Roosevelt Rd. - Alder's and Joe Stein's. By the time I became part of the family in the mid-1950s, Alder's was gone but Joe Stein's was right across from the Edgewater Beach Hotel on Sheridan Rd. as mentioned above. Joe knew Pa Schwartz from the old days. The food was remarkable. Joe pickled his own green tomatoes. One specialty that I fondly remember was karnotzela (sp?). It was ground beef spiked with whole pieces of garlic. Heavenly. Joe used to tell us to come back soon and often. He'd say that his son's had no interest in the restaurant business and that he wife could only keep the place going for about six months. Guess what? Joe died and his wife kept the business going for the predicted six months and then closed it down. I don't recall ever having the Romanian skirt steak because the karnotzela was so special. I see that What's Cooking in the Lincoln Village Shopping Center has "Chopped Steak Romanian Style" on the menu. I doubt if it compares to the Joe Stein's delicacy. Actually the best Romanian food I ever had was cooked by Ma Schwatz. Her hot and sour beet borscht was fantastic and her chopped calf brains (parboiled, skinned, and sauteed in chicken fat with a little onion) was equally delicious. BTW - Pa Schwartz ate all that high cholesterol food and lived into his 90s. Ma never used a cookbook and had learned to cook from Pa's sister. My ex-mother-in-law used to occasionally watch Ma cook and write down some of Ma's recipes. Unfortunately my ex-wife has no idea where the recipes went. Pity. Ma's Romanian-style food was some of the best I've ever eaten. I'm wondering if the know/don't know dichotomy is an urban/suburban issue. It looks as though everyone who is describing this dish ate it at places in the city. Growing up in the suburbs, when we went to the city, it wasn't to go to a deli or diner (we had those in the suburbs), it was to go to Chinatown or Su Casa or Diana's Grocery. And if we went to a deli, it was for pastrami or corned beef -- steak was something dads did on Weber kettles in the backyard, it wasn't something you ate out, at least not with kids -- except for minute steak sandwiches. I've been Romania a few times and have more than my share of Romanian cookbooks. I know of none that specialize in Romanian Jewish cooking. Though it's not quite the same thing, there is Taste of the Past: The Daily Life and Cooking of a Nineteenth-Century Hungarian-Jewish Homemaker by Andras Koerner, available from Amazon. There are some other oddities out there, too, like Paul Kovi's book on Transylvanian Cuisine, which is primarily Hungarian (and long out of print). I am fascinated by Mike G's original post and all that has followed and, in a few more days when I've had a chance to gather my thoughts, I intend to respond more fully. There are, for example, Romanian dishes such as fleică la grătar, a grilled steak, as Romanians do--like many southeast Europeans--favor grilled meats generally. Cynthia wrote: I'm wondering if the know/don't know dichotomy is an urban/suburban issue. It looks as though everyone who is describing this dish ate it at places in the city. Growing up in the suburbs, when we went to the city, it wasn't to go to a deli or diner (we had those in the suburbs), it was to go to Chinatown or Su Casa or Diana's Grocery. And if we went to a deli, it was for pastrami or corned beef -- steak was something dads did on Weber kettles in the backyard, it wasn't something you ate out, at least not with kids -- except for minute steak sandwiches. I think, Cynthia, that it may be a generational issue rather than an urban/suburban issue. I was born in 1936, grew up in Hyde Park and South Shore, married in 1958 and moved to the north side. I bought a house in Morton Grove in 1965 and currently live on the North Shore. I consider myself a Chicagoan, but currently enjoy the excellent suburban restaurants. We used to have Lyric Opera tickets but the drive into Chicago became so tedious that we gave up our season tickets. If I recall correctly, the restaurant scene in the suburbs was quite limited during the 1950s, so many suburbanites had to travel to the city for good food. There were exceptions, of course, but there weren't strip malls then and storefront restaurant throughout the suburbs. There are, for example, Romanian dishes such as fleică la grătar, a grilled steak, as Romanians do--like many southeast Europeans--favor grilled meats generally. Yeah, I think sort of like our old friend Chicken Vesuvio, it's not that it was something nobody ever thought of making before (though when the marinade includes soy sauce, as it often does, clearly we're out of Transylvania and into the melting pot of lower Manhattan); it was more that giving it a name and marketing it as a signature dish was particularly useful for non-Italians or non-Jews visiting those respective exotic neighborhoods and wanting the name of something reliable to order. Grandpa Bob wrote: Her hot and sour beet borscht was fantastic and her chopped calf brains (parboiled, skinned, and sauteed in chicken fat with a little onion) was equally delicious. paulette wrote: Skirt steak was not called skirt steak when I was growing up and you bought in kosher butchers. It was known as tenderloin. I remember going to Jewel after I married in 1960 asking about tenderloin and as you guess you know what they gave me. I'm not sure when I learned the name skirt steak so that I knew what to get. This is what I recall as well. Those "tenderloins" were a regular feature at home, and a special treat at Sam and Hy's if you weren't getting a corned beef sandwich (or a francheezie). They were usually "tenderized" by one of those machines that essentially pre-chewed the meat for you. This is still the default preparation at Roumanian on Clark (unless you specifically request otherwise). I love skirt steak and have fond memories of it being the only steak my Jewish mother would make. We grew up in Albany Park and there was a kosher butcher we went to. When we moved to Skokie in '67 he would deliver to us from the city. ha that was funny or whatever is on sale) mixed together, a higher percentage of the Italian dressing. It's a roundabout way of referring to a long-ago discussion of Chicken Vesuvio, in which the contention was made that there's nothing so distinctive (or even fixed) about that Chicago dish that doesn't fall under the heading of "how Italians have baked chickens for eons." Probably a name was attached to it by a particular restaurant (possibly one called The Vesuvio on Michigan Ave. back then). As for this notion of concealment, curiously making its second appearance in this thread... hard to see that a restaurant called Goldstein's located near Maxwell Street, or a proprietor named Shulevitz, is exactly hiding anything just by calling it "Roumanian." Unless you think Chicken Vesuvio is hiding something by not being called Chicken Catholico. I still ask the butcher the "tenderize" my skirt steaks--love those little holes. But in my family we marinate in "Jug" barbecue sauce only (orange bottle, looks like its "woven" with plastic LOL). We only useJug for skirt steaks and we don't marinate the steaks in anything else. Grandpa Bob wrote: One specialty that I fondly remember was karnotzela (sp?). It was ground beef spiked with whole pieces of garlic. Heavenly. Karnatzlach. It's what I translated loosely as "sausage" from "Rumenye Rumenye." Yes, kosher butchers have tended to label kosher meat cuts by the names of treif cuts. For example, you see things labeled "London broil" or "flank steak" that I think must be chuck or skirt steak. Last night, I was at a kosher dinner at the Westin North Shore hotel in Wheeling, which has elaborate kosher kitchens. We were served what was initially called "lamb loin" -- which it could not have been, since the loin isn't kosher. It turned out to be boneless lamb rib chops. paulette wrote: Tenderloin aka skirt steak was a tender less fatty steak and relatively inexpensive as well as being kosher where there are so few options for steak. The only other tender steak would be rib or rib eye. There was something called a beauty steak which I think is eye of the chuck but I'm not sure. "Beauty" steak is ribeye, at least most of the time.